Karen Margaret Synon was born in Moe, Victoria on 15 September 1959 and attended Whitehorse Girls' College and Blackburn South High School before completing a Master of Business Administration at the University of Melbourne. Prior to embarking on a parliamentary career, Synon worked in a range of community development and education roles and in a senior management role in the Victorian public service. In 1986 she founded the Westgate Community Initiatives Group, a not-for-profit organisation based in Melbourne's western suburbs providing employment services for disadvantaged jobseekers. 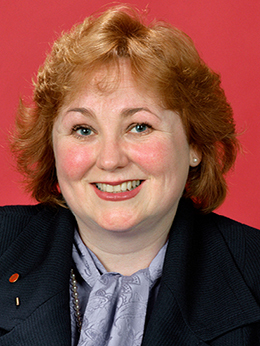 She served as General Manager of the group's training program (1987–93), before being appointed as Director of Employment in the Victorian Department of State Development, a position she held until taking office in 1997. Synon's ascension to political office was less than typical, her tenure brief and her departure clouded in controversy. She was appointed to the Senate under the casual vacancies provision (s. 15) of the Australian Constitution in May 1997 following the resignation of Victorian Liberal Senator Jim Short. After a perceived breach of the government's Ministerial Code of Conduct, Short had resigned his position as Assistant Treasurer in October 1996, and seven months later he announced his resignation from the Senate. Synon was immediately drafted into the vacancy, noting somewhat ironically in her first speech that the speed of her appointment—Short resigned on 12 May and the Parliament of Victoria appointed her the very next day—was 'indicative of the "can do" approach of the Victorian government, led by Jeff Kennett'. At the time of her appointment, she was the youngest ever Victorian Liberal senator. In trying to put in place a safety net, we have created a security blanket that many refuse to give up. We have bred an entitlement mentality; a culture of dependency. This assertion of rights without countervailing responsibilities is destructive of cohesion in society and ultimately destroys the individual as well. I stand on this side of the chamber because I believe in Liberal philosophy that asserts the worth of each individual. Liberals declare a society is only just and licit if it respects the rights of each individual. What is sometimes forgotten is that we also require each individual to do the same, and in so doing create a society built on an intricate web of rights and responsibilities. Her strong commitment to employment and welfare reform, voluntary student unionism (VSU) and human rights during her brief time in Parliament epitomised these values. Drawing on her background in employment services, Synon spoke regularly on unemployment, particularly that of young people, and related issues, including what she described as 'the growth of the welfare culture in our country'. The 'work for the dole' system introduced by the government was, she argued, 'the quintessential example of mutual obligation in action' and a way to break the 'culture of dependency' produced by the social security system. For liberals it is a pillar of faith that the freedom of the individual must be protected. Yes, VSU is on the agenda. Yes, people are talking about it. But it has been on the agenda for 21 years and talk is not enough. Compulsory student unionism must be destroyed. As Tasmanian Liberal colleague Senator Eric Abetz remarked in his valedictory speech: 'You have breathed new life into that campaign and that will be a great monument to your very brief period in this place'. This campaign would ultimately bear fruit when in 2005 the Howard Government successfully passed its VSU legislation through both Houses of Parliament, thus ending, albeit temporarily, the compulsory collection of union fees by universities. By this time, Senator Synon's brief parliamentary career had been terminated. Though well-respected by her parliamentary colleagues, Synon's career was ultimately cut short in controversial circumstances with defeat in the 1998 federal election. A strong supporter of Victorian powerbroker Michael Kroger, whom she had met during her Young Liberal days in the mid-1970s, Synon became a casualty of the bitter internal Liberal Party feud between the Michael Kroger–Peter Costello camp and factional forces aligned with then Victorian Premier Jeff Kennett and Liberal Party State President Joy Howley. According to media reports, during the pre-selection process Kennett forces intervened in the selection of voting panel members rather than following normal processes and allowing the panel to be chosen by the party room. Synon, while declining to comment publicly, privately expressed the belief that Kennett had broken party rules. As a result, not even eighteen months after her appointment, Synon was demoted from third place on the Victorian Coalition Senate ticket to the unwinnable fourth position, with Kennett's preferred candidate Tsebin Tchen elevated to third spot on the ballot. Tchen was duly elected and in 1999 became the first Asian-born member elected to federal Parliament, while Synon's term ended after just twenty-five months in the Senate. After losing her Senate seat in 1999, Synon maintained a relatively low public profile. She remained active within the Liberal Party, chairing the Victorian Liberal Women's Organisation in 2004. She was appointed to the Refugee Review Tribunal and the Migration Review Tribunal as a part-time member in 2001 and 2004 respectively. Despite media speculation at the time, and widespread expectations amongst her Senate colleagues, Synon has not sought to resume her parliamentary career at either state or federal level. 'Profile: Senator Karen Synon', House Magazine, 22 Oct. 1997, p. 3; Age (Melb. ), 15 March 2007, p. 2; CPD, 3 Sept. 1997, pp. 6325–9. CPD, 24 June 1999, pp. 6425–7, 3 Sept. 1997, pp. 6325–9. CPD, 13 May 1998, pp. 2766–8, 25 March 1998, pp. 1251–3, 30 June 1998, p. 4419, 26 Nov. 1997, pp. 9584–6, 2 Dec. 1998, pp. 1150–1, 24 June 1999, pp. 6420–1. Australian (Syd. ), 6 July 1998, p. 2, 8 July 1999, p. 2; Age (Melb. ), 10 July 1998, p. A2.